The company REW Regenis stands for waste to energy with high efficient machines. All machines are working continuously day and night, eco-friendly. They are closed and very save and have less pollution. Apparatus are installed after biogas plants, compost plants and after production companies with waste. Our company is placed close to the city of Osnabrück in Lower Saxony, Germany. Since 2004, the company provides with the brand Regenis innovative technology products in the field of energy from residual waste biomass and renewable raw materials. With the vast experience and broad expertise, as well as the know-how and many years of practical experience of our engineers, designers and technicians, we are developing patented high quality power generation equipment and concepts. Our company has expertise in dewatering, drying and pyrolysis of Sewage Sludge, Biomass Utilization and producing heat, fertilizer, Biochar, syngas and heat all bioproducts. Our customers and partners are from the industry, agriculture and municipalities. The main advantage of our conti-reactors is less specific cost because of high efficiency with less energy use. The result of using our power generation equipment: waste to energy. We are looking for business contacts with other companies, which are producing biogas, fertilizer or other biological utilization. 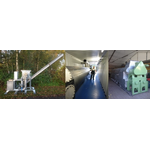 As well as other companies which are active in the field of industrial measurement in the biogas sector. Furthermore we would like to offer our products to agricultural companies and other interested companies and businesses.